Summer Family Fun with the Caravan Club! 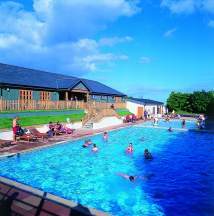 Why not make a splash this summer at one of four Caravan Club Sites with swimming pools? Head to their Hillhead Caravan Club Site in Devon, kids will love the heated swimming pools, games room and skateboard ramp! The Grafham Water Caravan Club Site in Cambridgeshire is an ideal base for family fun - there’s a swimming pool on site but take a short walk and you’ll find the international centre for fishing, windsurfing and major sailing events with other activities including cycling, horse riding, tennis, golf and karting all nearby. Use the outdoor heated pool at the Seacroft Caravan Club Site in Norfolk or head down to Cromer’s sandy beaches to build a sand castle or two. Why not join The Club and book a pitch at the Looe Caravan Club Site in Cornwall? The crazy golf, tennis court and pool will keep the kids entertained for hours whilst you relax amidst conifers and flowering cherries with distant views of Looe Bay.